TAKE A LOOK AT THE SERVICES ON OFFER AT THE NAIL SHED, THE PERFECT DESTINATION FOR ALL OF YOUR BEAUTY NEEDS! Surprise your family, friend or colleague with the gift of relaxation! Be rewarded for being loyal, buy any 9 treatments andreceive 50% off a nail treatment of your choice. 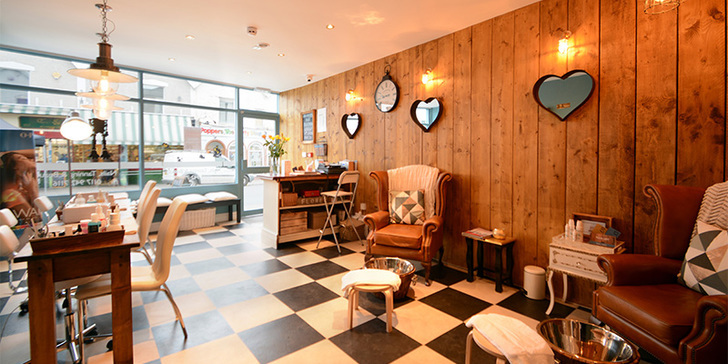 Looking for the perfect party for young beauty lovers… Why not try a Nail Shed manicure party? Aimed at ages 6-13, each person will receive a mini manicure with the option of adding nail art to really make it fun! Drinks and sweet treats are provided to really make it a party atmosphere! Our therapists will be solely dedicated to the party meaning that the birthday girl and her friends have the run of the salon! Prices start at only £15 per head with a maximum party size of 12. Call us for availability or to book in. The Nail Shed is committed to only using the best professional products available for all of our treatments. As part of this promise, we are proud to use OPI’s products and techniques to provide the best results. Time to put your feet up and relax! The Shed Pedicures have been designed and perfected to provide you with a relaxing treatment which will leave your feet feeling and looking gorgeous! CND Shellac is the ultimate power polish. The product has revolutionised all manicure and pedicure treatments, there is no drying time and will remain flawless for up to 2 weeks. Treat your little lady to a manicure or pedicure! Includes nail shaping, hand/foot massage, polish and some very funky nail art! The Nail Shed have invested a great deal of time in researching the tanning solutions on the market and Xen Tan was the clear winner. Xen Tan is a multi-award winning tanning solution that is a firm favourite with celebrities and beauty magazines. It provides a gorgeous natural looking glow that smells delicious! The Nail Shed uses wax containing Aloe Vera for its skin repairing properties to ensure that our waxing treatments are not hair raising! The new must have lash treatment! LVL Lash lift provides you with the appearance of longer, thicker lashes. Just perfect lashes from the moment you wake up. You will be amazed and lasts up to 6-8 weeks. Janssen Cosmetics is the latest innovative skincare that is 100% vegan and organic and delivers outstanding results. Our facials are tailored to each of our client’s needs.